This drawing room in a stately home had historically inspired stencil work to the walls,which was in turn antiqued and mellowed by distressing and patination. The surface was further modified with a translucent paint glaze. 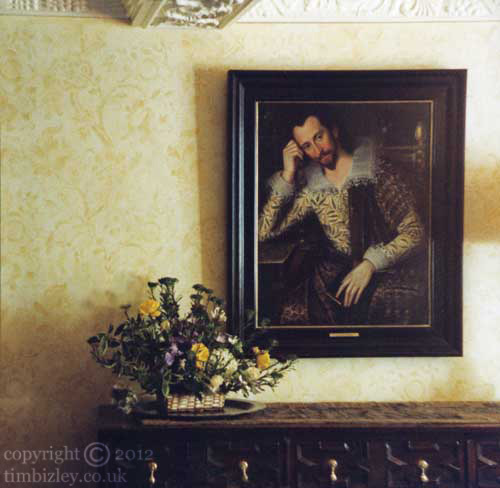 The result provides a soft effect which is easy on the eye and links to the art, furniture, period items, and date of the Jacobean building. Specialist decorating using stencilled designs is a useful way of creating decoration with an authentic historic feel. The use of the stencil for decorative purposes has a long tradition from the Jacobean and earlier, through to the Victorian Gothic and Arts and Crafts. The employment of the stencil in specialist decorating for the establishment of ornamentation is an ideal method for the restoration of the period interior. Stencilled decoration designs because of their actual use in various past periods is an authentic means to this end. It is usual to design and hand cut stencils for each brief, these can be either simple or complex, single or multi- separation all depending on the intricacy of colour and tone required as the end result. Modifications to the overall look can be achieved through various means from distressing to patination paint effects. This work was commissioned by an interior designer in the U.K. for a private client.